Lora Alexander joins us again at Munsell to talk about the importance of using color analysis to find the right makeup colors. You can read more of her blogs on color at Pretty Your World. As a color analyst and makeup artist, you would think I absolutely love going to makeup counters. The complete opposite is true. I’ve probably made only 4 trips to the makeup counter in my life and one was required for a school project. Why the aversion? I despised high pressure salespeople in general and I’ve experienced some of the highest pressure ever from a few behind a makeup counter. But more than that, as a color analyst who knows how important wearing your right colors is, I cringe when I hear the all too common phrase “that [color analysis] is nonsense. Anyone can wear any color they want.” And they proceed to apply the most unflattering colors imaginable to my face. Though not at an actual makeup counter, the most dreadfully memorable experience regarding makeup was at a regional meeting for a very popular home party makeup company over 20 years ago. I agreed to attend with a friend who was just starting out with the company. To my dismay it was “Pink Night” as they debuted their ‘hottest’ shades of the season which included every shade of pink and purple you could imagine. Being young and shy and hating confrontation, I really didn’t want to appear to be difficult but I did say nicely, “Actually I’m an Autumn and pink really isn’t my best color”. The featured ‘makeup artist’ of the night was male and kind of cute and he of course said “That’s non-sense. Anyone can wear any color they want to.” So I thought to myself, “ok, have an open mind.” Needless to say I looked ridiculous. With my reddish blonde hair, ivory skin and green eyes, the pinks and purples just looked like clown makeup. Even though it was the late 80’s, famous for its garish makeup, I still looked ridiculous. I went home and cried. I already had self-image issues and this did nothing to boost my self-esteem. I then became angry because I knew that this guy HAD to know this looked awful on me. He didn’t care; he wanted to make sales. After many years of studying color analysis, I know that the right makeup can make or break a person’s looks. Studies have shown that not wearing any makeup in the workplace can make a woman appear unprofessional. But wearing the wrong colors can make one look clueless in addition to looking unprofessional. It can also age her unnecessarily and create the look of incompetence. But once you know your best colors (or your ‘season’), you will always know what colors will make you shine. Finding one’s season involves looking at skin tone, eye color and hair color and finding a palette of colors that harmonize together beautifully. Albert Munsell’s principles of: color hue, chroma and value are exactly the same thing I look for when I analyze a client. Choosing the right makeup colors involves finding colors that match your value (how light or dark you are), your chroma (how clear or muted you are) and temperature (how warm or cool you are). Know your 3 characteristics and you are set. 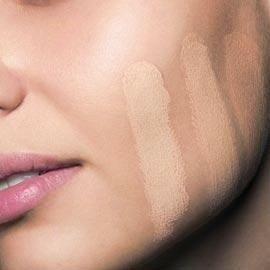 Most important of the 3 characteristics with regards to makeup is undertone, particularly with foundation. Many people may remember the old fashioned foundations that were either too pink or too orange. Foundation quality has come a long way. There has been a push for more yellow based foundations recently, and this is great if you have yellow undertones. But someone who is a purely cool person – such as a blue-eyed ash brown brunette with skin that has a pinkish glow to it – would not look good in a yellow based foundation. She would want a cool to neutral based foundation. The same would go for eye shadow and blush. A person with warm undertones wearing cool colors can look artificial. A person with cool undertones wearing warm colors can look downright ill. If a Warm Autumn with naturally red hair and green eyes wears pinkish blush and lipstick and blue eye shadow (left), the colors just ‘sits’ on the skin and doesn’t harmonize. You notice her makeup before you notice Her. But when she adjusts her makeup to match her natural coloring (right), the colors blend right in. You notice her first, not her makeup. While one may think that no one can pull off blue eye shadow (there was even a famous book written on the topic), I disagree because look at an example of a Clear Winter (“Pure Winter”) below. The depth of her coloring and her ability to handle clear saturated cool colors allows her to be able to wear blue eye shadow if she chooses too. Add cool pink blush and lipstick and you have a gorgeous glamorous look. These colors on anyone with warm undertones would look clown-like. But this woman can handle it. This is where it all comes down to Munsell’s principles again: Hue, Chroma and Value. Know what your 3 characteristics are and you’ll never make another color mistake again. Cosmetics is a fascinating part of color. Thank you for this interesting post.